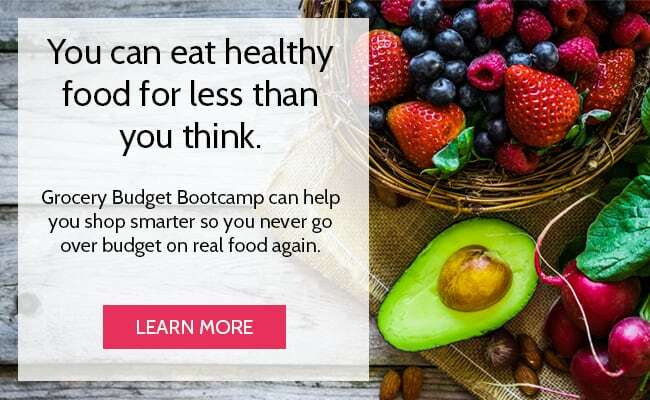 One of the biggest issues I hear frugal real foodies struggling with is finding affordable real food without having to drive all over dodge. Over time, you find a routine as to what stores or markets work best for your budget, your time and your area. But I remember first starting out and wishing there was some totally awesome list that someone else had put together for me, just coming right out and telling what stores had the best deals on certain items. It would have been helpful too if they told me what NOT to buy, and their reasons why. Back then, I was neck-deep in information overload. My mind was swimming with random bits and pieces about nitrates and BPA and high fructose corn syrup. 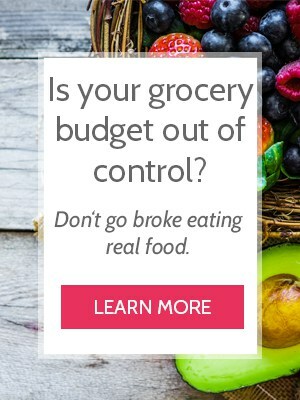 I felt like throwing my entire kitchen in the trash can and spending a paycheck or two at Whole Foods, but that wasn’t possible with our small grocery budget. Besides, one paycheck won’t get me very far there! Today’s post is an ode to you folks who are feeling this pain. Those who are trying to eat better and not go broke. Those who are making more foods from scratch, but simply don’t have the time or energy to make ketchup or butter. Those who have embraced homemade bread, but are still trying to get their families to embrace whole grains. California is the only state that grows almonds commercially, and since the state requires almonds to be pasteurized (with either propylene oxide or high-temperature steam-heat), I figure there’s no point in forking over the money for “raw” almonds when they’re likely not raw anyway. Hands down the best price I’ve found anywhere. Not even Amazon can beat it! This equates to just 68¢ per pound, which is an amazing price for rice. We also prefer the taste of jasmine rice over long grain white or brown. It’s just a hint sweeter, and fits well with most of our meals. The term “all-natural” is not regulated and has no official meaning, so it’s up to us as consumers to read the ingredient label and decide for ourselves whether it’s truly natural or not. 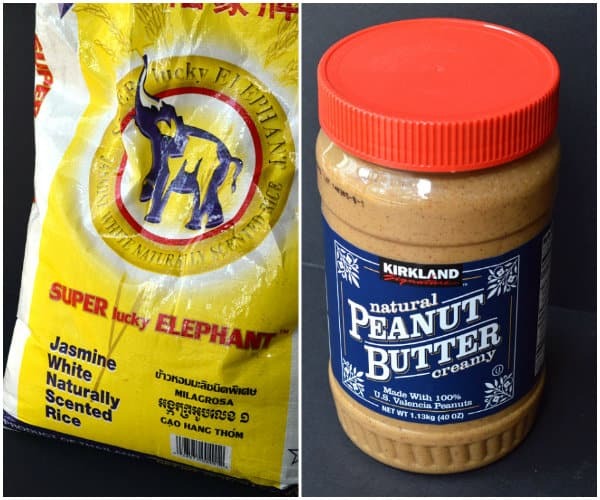 Kirkland brand all-natural peanut butter contains just peanuts and salt. The only way you’ll be able to beat this price is if you buy vanilla beans and liquor in bulk and make it yourself. I’m not there in my journey yet, so for now, this is my go-to shop for vanilla. A KILLER deal for yeast. Those little single serving packets are expensive on their own. Buying in bulk equates to just 2¢ for every teaspoon of yeast. After this fridge test and even more research after the fact, we’ve decided that the Tuscan EVOO at Costco is pure olive oil and the best we can get at an affordable price. The only downside of these chips is that they contain soy lecithin. Fortunately, we’ve eliminated soy from just about everywhere else in the kitchen. We’ve really cut back on our use of chocolate chips since we started eating real food, so this doesn’t concern me much. I haven’t noticed any difference in quality between these and the Nestle TollHouse brand either, so these are a winner. Most commercial flour is enriched, meaning there is synthetic vitamins and minerals added to the flour after the berries have been ground. The only way to avoid this is to buy either un-enriched and un-bromated flour, or go organic. We make all of our breads from scratch, and although we’re on average 75% whole grain, we still use white flour on occasion. Buying in bulk equates to paying $2.99 for a 5lb bag, which is a great deal on organic flour. After reading about the differences between all the different types of oats on the market, I decided that the Quaker Old Fashioned Oats from Costco offer the best bang for our buck. They earn points for not being partially cooked like the instant oats, and since they’re basically steel cut oats that have been squished, I don’t see the point in paying more for the unsquished version. Mmm. Kerrygold’s butter is grass-fed, and is the yellow-est butter I have ever found. It’s only a bit more per pound than organic butter, but incredibly more affordable than buying it at another local store where they sell it for $4 per 8 oz! Most organic brick cheeses at Costco run this price, with the exception of sharp cheddar which is just a dollar more. $5.50 per pound of organic cheese is a really great price, and no other store in our area can come close. Organic ketchup contains sugar, but it doesn’t have high fructose corn syrup. Ketchup is another item that we don’t eat as much of as we used to, but when we buy it, it’s always from Costco. These are salted, but you can save a few pennies and get a 2 1/2 lb tub of unsalted cashews for $14.69. Like the almonds, the best price I’ve seen and they’re our preferred nut for homemade protein bars. Homemade pizza isn’t the same without fresh mozzarella cheese – the kind in water. It’s also just $4.66/lb, far less than any other store in our area. After watching the circulars week after week, and even price comparing with a coupon, Costco consistently offers the best deal on granulated sugar. Granted, I know this isn’t 100% “real food” because it’s not completely natural, but we use it for kombucha, baking bread, some desserts and Mr. Crumbs’ coffee. My general rule of thumb is to bake with honey, but not every recipe is completely adaptable. We average buying this every four months, and that’s something I can live with. I did try organic sugar one time but it cost twice as much and the bag was half as big. For now, for our budget, we’re sticking with the plain white granulated. We love these tomatoes in our Greek dishes, and this is just a mere fraction of the cost in other stores. Trust me, I found out the hard way when we ran out at the last-minute and we had to make a quick stop at Savemart! Yikes! Like the sun-dried tomatoes, another killer deal. Local stores charge nearly the same price for a teeny tiny jar! If I’m short on time or feeding a crowd, the Tortilla Land flour tortillas would be in my cart. They contain canola oil, but no other weird ingredients. This is definitely a compromise food in my opinion, but sometimes homemade tortillas just aren’t in the schedule, ya know? That price is for blueberries. A berry blend is $9.99 for 3 lbs and mangoes are $8.69 for 4 lbs. My eye has been on these throughout the winter, and the price hasn’t changed. We tend to buy these usually over the winter, but this is a really great price that might even give fresh berries a run for their money! Previous trips to Costco almost always contained apples. After finding local organic apples for a better price at the farmers market, this might change. Of course, if they’re not in season, Costco still has the best price in town. This is for the single big container. The smaller honey bears are priced at $12.99 for (3) 24 oz, and are actually more per ounce than this big container. Lately we’ve ordered raw honey from Tropical Traditions or Amazon. This might very well make it to my “always” buy list. It tastes amazing, and the large bottles mean I don’t feel bad making lemon vinaigrette dressing every night of the week. We bought this Mid-March and we’re just barely halfway through one jug. Although it’s a bit more out-of-pocket since it’s bulk, it’s turning out to be a huge money saver over the course of time. Our favorite blend is the organic San Francisco rainforest, which occasionally goes on sale for $9.99 for 3 lbs. If it does, we stock up! When we don’t by coffee from Costco, it’s another item we order from Tropical Traditions using gift certificates. We usually buy this when we’re about to make our own yogurt, but it’s also on the list when we’re needing a lot of yogurt or planning lots of meals using it. It’s a good bang for the buck since it’s thick already – perfect for homemade dressings and sauces. We’re not huge quinoa fans, but it is nice to change up the menu now and then. 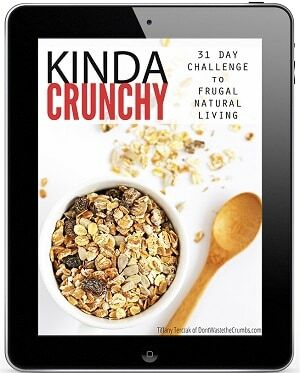 It’s only $4.75 per pound too and packs a huge nutritional punch. That price is for organic chicken stock, but I would never buy either one of them because it’s SO easy to make your own using the carcass and bones from whole chickens. Homemade chicken stock is like a free by-product of buying chickens. 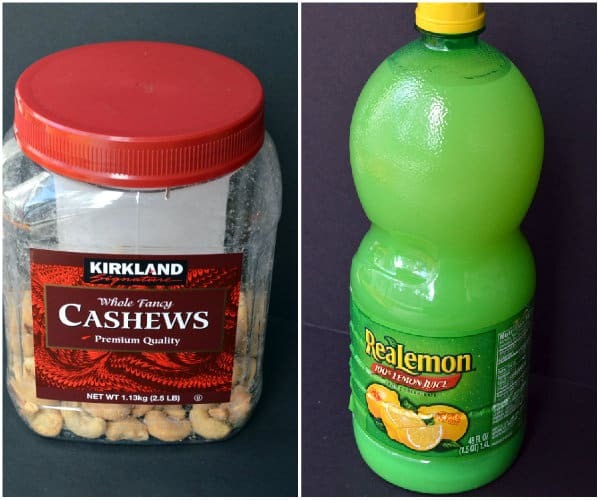 If you want to get technical, the only true cost is water and apple cider vinegar, but even if you account for those, it’s infinitely cheaper to make it yourself. This milk is UHT, which of all the milks available, is the one with the least amount of nutrients left. You can read more about pasteurization here. I can actually get HTST organic whole milk for a few pennies less per gallon! It only took one time of making homemade apple butter to say bye-bye to store-bought jellies, plus it costs just $2 for a 16 oz jar of organic butter! Check out this post for a tutorial and recipes to get started. Peanuts are not at the top of my list in terms of buying organic, so organic peanut butter isn’t a priority. Besides, we’ve gone through A LOT of peanut butter lately and the natural version with just nuts and salt is much more affordable. I usually buy my coconut oil from Tropical Traditions, but I’ve heard good things about the Nutiva brand available at Costco. Tropical Traditions typically has great prices on coconut oil, but sometimes when I need other items too I’ll order it from Thrive Market. And right now you can get a jar of coconut oil for FREE with this link! Get a free 15 oz jar of coconut oil AND a 30-day free trial to Thrive Market when you spend $29 or more (free shipping on orders $49+). We don’t have any nut allergies, so we’ve always bought peanut butter. However, if I was looking to buy almond butter, Costco has the best deal. They sell two brands: Maranatha for $9.79 (26 oz) and Organic Brad’s for $15.99 (24 oz). Maranatha is the better deal per ounce and unless I was specifically looking for organic almond butter, that’s what I would pick. We still have a few boxes of baking soda leftover from my couponing days, so it’ll be some time before we have to buy it again. However, when we need to, we’ll buy it from Costco – it’s just 38¢ per pound. That’s WAY better than any coupon price I found! We use heavy cream mostly during the holiday season. This is a recent addition to our Costco so we haven’t had a need to buy it yet. However, I’m excited that it’s available and that it’s organic!! Like the flour tortillas above, this would be another compromise food. We usually make our own, but $2.99 for a 24 ct package isn’t a bad deal if you simply don’t have the time or energy to do it yourself. Plus since they’re organic, they aren’t GMO. Some of the best deals on produce and meat can be found at Costco, but unfortunately, the prices on those vary tremendously from region to region. Local produce is always best, but I think I’m a bit spoiled since many growers grow in California… so the produce at my Costco is local. 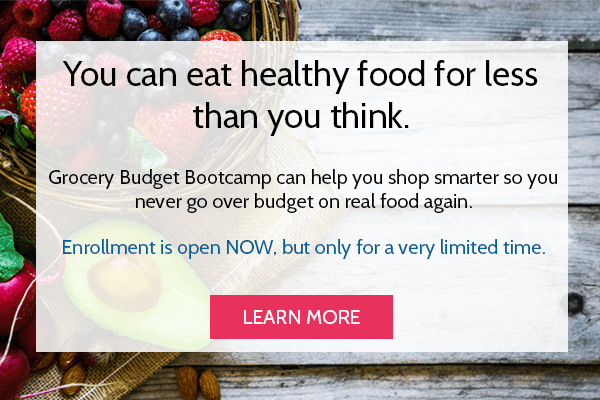 If you’re still working on creating a grocery budget, know that buying in bulk will save you money over time, but that it requires an up-front cost that can sometimes be difficult to afford. Aim for just one item each budget cycle and go from there. 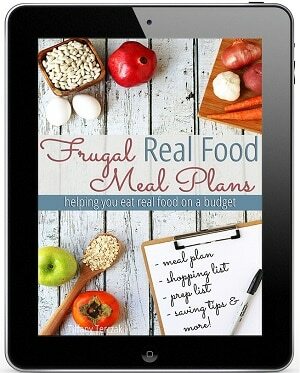 Soon you’ll create a meal plan from a stocked pantry and extra funds to splurge on better meat or organic produce!! What foods do you buy from Costco? What are your always, sometimes and never buys? I was a bit disappointed by how processed some items on the list are- but I understand that is up to each family and not judging at all. Since I work full time there are lots of homemade items that I cannot make, there aren’t enough hours in the day! Still, bottled lemon juice has lost it’s nutritional value, their Vanilla has sugar (probably GMO beet sugar, yikes!) AP flour is toxic, Quaker Oats are GMO, The nuts have been roasted at a high temperature making them now unhealthy and full of free radicals, unlike raw nuts. The Fage yogurt at 0% fat means your family isn’t getting the healthy fat yogurt offers too. Just Saying. I do purchase Organic Coconut Oil, Kerrygold Butter, Organic Eggs (If I cannot get pastured), Raw, local honey, Organic Maple Syrup, and seasonal Organic Fruit when they have it. Lot’s of cooking gadgets. the occasional clothing item, yard items and so much more.. It’s fun there! Certainly more real food opportunities than Sam’s club. Thanks for the list it was a good read. Thanks for your comment Gwen. You make good mention of a few things, but I do have questions. Do you have a link to support the claim that AP flour is toxic, and the oats being GMO? Where do you get your nuts from? I cannot find whole milk yogurt, for an affordable price, anywhere in my area – so I make my own whole milk yogurt using the Greek yogurt as a starter. I’ve never seen raw honey at my Costco! I like your response and was wondering about her sources as well. Just fyi I get raw local honey at my Costco and its $8.97 for a 3lb bottle – so not too bad. Thanks Debbie. 🙂 I’m always watching for good deals at Costco, so hopefully mine will have raw honey. $9 for 3lb is a STEAL! The lowest I can get it is $10 for 1 pound at the local farmers market. There is no such thing as GMO oats. There may be research into the crop, but as of now, there are NO commercially released GMO oat varieties. Please, please, please – check your sources. There are actually very few GMO crops in commercial production, and the easiest way to avoid them is to avoid processed food and buy organic sources for foods like meat and sugar. Just because they aren’t yet GMO it doesn’t mean they aren’t chock FULL of glyphosphate! I won’t even go near Quaker Oats, and you shouldn’t either. I agree that oats are not GMO but maybe the previous writer was relating GMOs with Quaker because Quaker is listed as a company that supports Monsanto. This is the reason we stopped buying them. There’s no such thing as GMO oats. Good grief. And all purpose flour toxic? Sheesh. We don’t buy the oats because we just buy whole oat groats from Azure standard, but we do buy that exact AP flour. My husband uses it for his sourdough starter and makes mixed whole wheat and white wheat breads. This was really helpful! We also buy organic valley cheddar at our Costco. We used to buy organic jarred tomatoes there, too, but they stopped having them at the end of last summer. They had a really great price, too, so that was sad. I’d like to look into Azure a bit more this year, but my fear is that there aren’t enough locals to warrant a drop. They’re schedule for my area just once a month, and if there isn’t enough, it’s cancelled… that would be bad news if I was counting on that shipment! Oh yes, cheese too! Did I mention that? I’ll have to go back and look…. You mention jarred tomatoes, and I could have sworn I saw those there too in the past. At least I’m not going crazy!! Great list! I buy big bag of chia seeds from Costco which is way cheaper than I found anywhere else, will start buying quinoa as well. I did not know they carry Kerrygold butter! Olive oil, maple syrup I always get from Costco too. Thanks Shirley! We buy chia seeds from there too, and one bag seems to last forever!! Thanks so much for taking the time to give so much detail to this post! 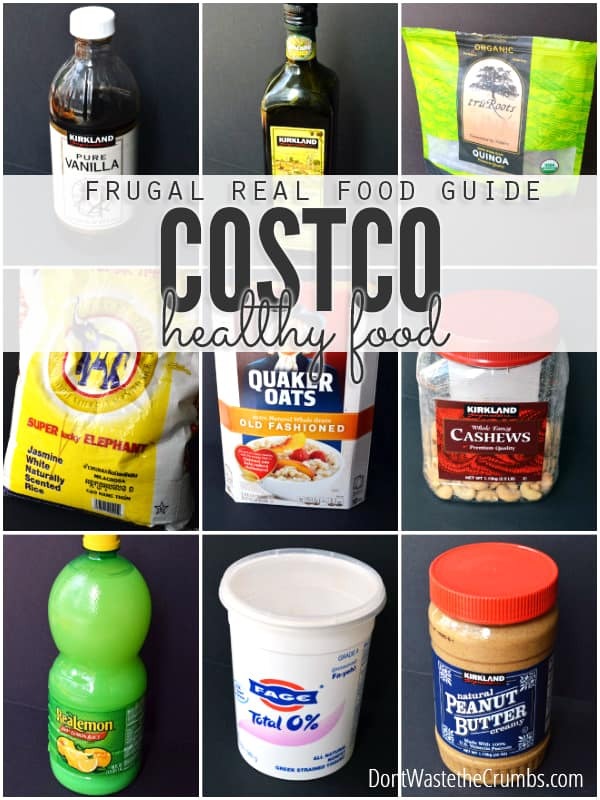 I’ve never shopped at Costco before, but with out new journey into more natural and traditional foods, I’m considering it, and this post was very helpful. One question after reading is, Where do you buy your milk? How would you know if it is UHT or not? You’re most welcome Kali! I buy my milk from Savemart, a local grocery store. It’s organic, grass-fed and HTST pasteurized. Most milks in cardboard boxes are UHT, but it should be labeled as such. BTW, it helps to read several packages for “about” information. I only know it’s grass-fed because it says so on the UHT half-gallon size. I bought it once (w/o realizing it was UHT), read the container and saw that the entire line of their dairy was from grass-fed cows! Hi Tiffany, we also buy our organic milk at SaveMart (we’re in Central Cali). I’m curious which brand you purchase (I don’t know I’ve looked that closely to notice one being grass-fed, but I definitely don’t go for the Ultra-Pasteurized). Hi Samantha! I buy Sunnyside Farms. The mention of grass-fed is on the UHT half-gallon in the cardboard container, but we buy the whole gallon that’s just HTST. Big wave to you neighbor!! Our regular costco trip (once a month, since our closest is 45 minutes away) includes Organic coconut water (my husband uses it in his post-workout smoothies), many of the other organic items you mentioned above, and because my stock-up trip seems to always end up during my monthly ‘visitor’, the organic dark chocolate-covered pretzels (nom nom nom!). LOL! I don’t think I’ve seen those pretzels at my local Costco… but it sounds like that’s good thing! 😉 We used to buy coconut water as well, but at the rate at which we were going through it, I started switching out whole oranges instead. They’re very juicy, and help thinning out smoothies a bit. Great list, Tiffany. I’ll just add that my Costco carries organic natural PB (Kirkland brand) intermittently. It’s hands-down the best price I’ve ever seen…as is their price on organic Chia seeds. Thanks Dena!! Our Costco stopped carrying this PB for awhile, and then it came back. It’s a HUGE struggle with my inner-frugal self to NOT stock up on several jars at once, lol! On the coconut oil: my Costco recently discontinued the Carrington Farms coconut oil and has replaced it with a Kirkland Signature branded variety that is sold in two-packs (don’t remember the size — maybe 54 oz each?). Do you (or anyone else) know if this oil is any good? I just really hate to buy that much before knowing if it’s any good! I’m sorry Victoria, I haven’t heard anything about the KS brand coconut oil. The next time you’re there, turn the bottle around to see if it mentions being made by a particular company. The KS brand tortilla chips are made by Mission, so it might just be a re-branding/packaging! You can always return it… Even after opening and you don’t need a receipt! They will take any product back… It’s a great policy! I’ve been languishing in the land of No Costco for almost six years now, but word is we’re getting one this fall! So stoked. Sam’s has a lot of this stuff, but way fewer organic options and worse prices. Which is weird, because Sam’s has a lower income target demographic, so you’d think they’d be cheaper. Maybe they are on more SAD items. Anyway. EXCITEMENT that I might get to use this list soon! Oklahoma doesn’t know what it’s missing! Now we just need a Trader Joe’s and we’ll be all set! Are you by chance talking about the Costco supposedly opening in OKC before long? We are waiting with bated breath for that as well, lol. We’ve driven down to Dallas to go to Costco with my parents a couple of times (they had flown in from FL or we would do that more often). Also love the Sprouts stores down there, though I hear Norman has that now as well. Tulsa, actually, but yes! It was in the paper with a site and a date range, so it seems finally to be official and not just rumor. 😀 I’m glad to hear OKC is getting one, too, though, since Thera a small chance we may be moving there in the next year or so for hubby’s work. Yay Costco! Norman does have a sprouts… My parents shop there! Sam’s now has more Organic items and grass fed meat, great oils, Kerry Gold butter, cheeses, organic fruit and fresh organic vegetables and more. What area are you in California? Two of our local costcos don’t carry organic but the one a little closer does. But not all the stuff you mention. I’m willing to travel and stock up if I can get great deals. We’re in the Monterey area. Within driving distance? Hi Madison! I have to correct you – we “used” to live in the same area. We moved to Georgia last winter. 🙁 But I can still help! I went to the Sand City Costco. There is nothing else to visit in Salinas for me – most of our weekly activities centered around Marina/Sand City/Monterey. We just got a Costco in Green Bay, WI last fall and a dear friend gave me a membership for Christmas (I have a Sam’s memebership). Hands down, I LOVE the photo developing at Sam’s – which one would think would be the same as Walmart – but is not. Food wise, I love the organic choices offered at Costco. Just started a new Lifestyles program in January, offered through my employer. It focuses on whole grains and using food in as natural of a state as possible. I’m single so often it’s difficult to work with the large portions. One I love is their organic beets. I was craving them in the winter and the local store had 3 fresh “shriveled” beets for $3.99. Costco had a clam shell pack with 4 vacum sealed pkgs of peeled, cooked beets. 2# for around $7 and keeps for months. They offer the best whole wheat bread as well. Hard to find any breads (other than Ezekiel or sprouted grain) that doesn’t have sugar or sweetner in the top 3 ingredients. Costco’s brand (green wrapper label) was better than any of the other brands. I’m not a big bread eater, so 2 loaves lasted about 4 months in my freezer. Every time I go, I scope out a new deal. Oh, and the Wymans, organic wild blueberries? Totally addictive!! Just had some in my quinoa salad for lunch. I’ll keep shopping Costco. Have dropped 45# since January! Great list! Our Costco has most of the things you mentioned but we don’t always buy them due to allergies to wheat and dairy. Tortilla chips. Yikes. My downfall too!! Thanks for the post, this is a lot of what we get there as well. Unfortunately we do not have the organic AP flour here, in Northern Virginia. I could not even find it on the Costco web site. I wonder if it’s just found in California. We also get organic sprouted beans, btw, which are great because they cook fast and are easier to digest. Two thumbs up for the beans! 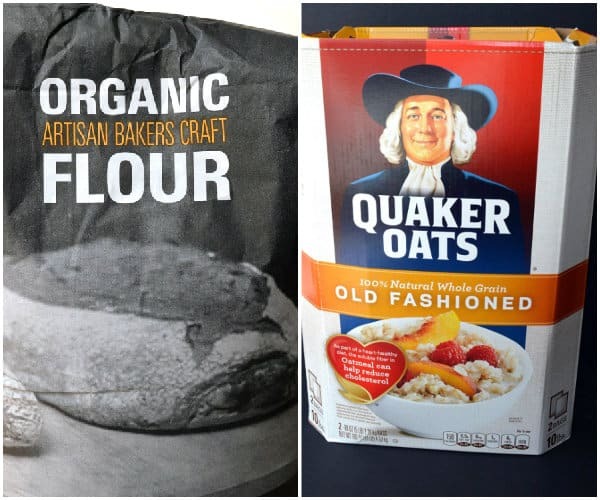 The organic AP flour is fairly recent – maybe you can put in a request for it at your local store? The Kirkland greek yogurt is a bit cheaper per ounce so I’m wondering if you’ve tried it or compared the two. I only bought the FAGE until a friend recommended the Kirkland being a better buy. My local Costco just recently carried the Kirkland brand Greek yogurt, and it tasted comparably. I don’t buy it in bulk too often, but it would likely be my choice if I did! I looked around quickly that last time I was at my Costco and didn’t see the Kerrygold butter or the fair trade coffee, or the flour or the organic cheese. Bummer. I’ll keep looking. Wondering if the butter is near the artisan cheeses instead of in the diary isle? They do have a good deal on the brown paper bag of AP flour which I buy about once every 4 months. I don’t find whole wheat pasta at mine either. I guess I need to write a letter to the manager. 🙂 Mine does carry organic milk -horizon brand I think and recently the organic PB. Yay! The Quaker oats are the best price around generally except when they are on sale at Sprouts. Yes, my Kerrygold is by the artisan cheeses! WW pasta is sometimes out of stock for me, but it normally comes back within a few weeks. Keep an eye out as you shop to see if some items are rotated in the shipping schedule… or definitely write that letter. 😉 I want a Sprouts! I’ve seen the good deals, and visited one once in SoCal. It was so much fun! Oh my goodness. I love this list! I like to consider myself a home economist, and have been seeking out deals at Costco for years! Thanks for taking the time to write it all down! I have yet to see Kerrygold butter at my local Costco:( So sad! The price for it at Trader Joe’s just went up too. There’s a local grassfed dairy I’ve been buying instead. Organic frozen strawberries have been the best deal I’ve found there. I love them! It’s like $10 for 4 lbs! I didn’t realize they have organic flour. I avoid the vanilla with sugar in it. They sell organic evaporated cane juice at mine for cheap. I also saw raw semi-local honey (I usually buy a jar that’s from a beekeeper less than an hour away but this was from next state so not bad). I’ve also been getting laundry detergent there that’s good for my baby’s cloth diapers. Almond milk is cheap as is most dairy. I found some good skillets too that aren’t yucky tefflon non stick. Coconut water (on sale), occasionally wine deals (for those of us not in CA lol), beer deals (that’s how I convinced hubby to go for the membership), it’s all good. Their brand of frozen pineapple is supposedly nonGMO according to my Buycott app. The organic preserves are best price- lower than the organic jam I was getting at Trader Joe’s. I love the olives and sun dried tomatoes but they really eat up my budget. I’ve considered their EVOO but Aldi has had organic EVOO cheap (IDK how authentic but whatever). BTW TJ’s has “Euro style whole fat organic yogurt” in a red tub for cheap. It’s even partially grassfed:) I do the Fage or Kirkland Greek yogurt for dieting though. The organic carrots are great but it’s really hard to use up whole bag. I love their produce deals though, especially clean 15. My local store doesn’t carry the “natural” PB anymore so I have to buy the organic but given how PB prices have shoot up last few years, it’s a good deal. Thx for the scoop! Yes, our Costco has a great deal on organic frozen strawberries and blueberries! The 10lb bag of organic carrots stays in our fridge for a couple months, but hopefully I’ll have a recipe for you soon on some quick breads that will help you use them up. You’re welcome – thanks for sharing your shopping tips in return! How do you get the carrots to last so long? Mine start looking yuck at the 3 week mark( usually slimy or white mild on teh top 1/2 of carrot)! I’m not sure Janice, they just do! I keep them in the bag they come in, in the crisper drawer. If yours start to look bad, I’d go ahead and either a) cook them all up and then freeze in portions, or b) grate them and freeze for various muffins. You might consider washing them before you store them in the crisper. Also, check the settings on your fridge. Some have different settings for the crisper drawer. It sounds like yours might be allowing too much moisture. Sometimes using some paper towels inside the bag to help keep too much moisture from forming might work, too. I use that method for green onions. It allows them to keep longer. It appears to be a time-of -the-year kind of thing. I am able to get the same brand though our food co-op and have only had the problem once. For a long while, Kerrygold butter was only available seasonally at our local Costco, but now it’s there year-round. I’ve found that the employees are very helpful about telling you if a product is available at that branch or not. Thanks Laurie! The coffee is a winner (I hear it’s the same as Starbucks?). Thanks for your ideas on olive oil, mangos and butter!! We also purchase a bag of lemons occasionally to bleach my kitchen island chopping block. I so appreciate a full pantry and freezer when meal-planning. So grateful. Wish I was sold on the whole organic chickens . . something about the smell on last 2 purchases. Maybe 3rd time a charm. (heh…I’m a “smeller” . . . esp when it comes to fish and poulty! I agree about the chickens. I used to buy them but the last couple of times they smelled awful. I switched to Whole Foods for whole chickens and fresh beef but still buy most other things at Costco or my local grocery. I noticed that the chickens used to be labeled “organic,” but now are not. The rest of the package looks the same and is sold in the same part of the store. For the most part, I buy local for chicken. Hi Tiffany! This may be a silly comment, but I grew up eating Skippy or Jiff PB and just recently bought my first 2 pack of Costco Natural PB. I have a really hard time stirring the oil back in before I use it each time because the bottle is so large. Do you have any tricks? Thanks! Let it sit upside down for a day before opening. It doesn’t solve the problem, but it helps. Once the peanut butter has been in the fridge and is cold, this is no longer effective. I, too, love the big bags of raw carrots. When cooked and puree’d, I will use them in place of pumpkin in breads, muffins, and custards. Wonderful flavor, and it’s like pumpkin in texture for the recipes..
Wow – great tip on the carrots Mary! Thanks!! Have you any experience with Amazon’s Subscribe and Save? If so, would you like to share your thoughts? Hi Sarah! I’ve used subscribe and save in the past and like it, except that I often forget to cancel my subscription. I don’t check them often, and REALLY don’t like getting an unexpected box in the mail… especially when my budget is tight. If you’re can stay on top of your subscriptions, then it’s definitely a good option. Tiffany, thank you for sharing this list. I shop for the majority of my food at costco and love seeing your real list with prices and comments regarding natural and organic. I love that they are bringing in more organic products at affordable prices. I love the nutiva coconut oil and have yet to find a better price, same for their organic EVOO. I also buy their white vinegar for my cleaning products, best price so far for a 2 pack. I forgot about lemon juice, which I am using more of due to making my own cleaning supplies instead of buying natural at the store. I look forwand to reading more of your posts. They touch on topics that are close to home for me as I also budget and try to find even more ways to cut costs without sacrificing quality. Thank you! Tiffany…are you familiar with Aldi’s? I’d like to know what you think if you are? I don’t have a Costco nearby…the closest one is 20 miles away. And do you think the savings at Costco are worth a 40 mile round trip? Thanks!! If you don’t mind me barging in, Whitney…I wouldn’t drive that far for a Costco, depending on what your closet options are. I prefer Costco to Sam’s Club, but Sam’s is expanding their organic offerings and they’re similar in the bulk-buy sense, if you have one of those closer. Also, if I recall, Tiffany doesn’t have Aldi, but we do, and I love it! I shop there first and then fill in what they don’t carry (they’re smaller stores with a smaller selection) elsewhere. They don’t carry much organic, but they do have a good amount of whole foods. Plus this is where I tend to buy snack foods, since they’re so cheap. 😉 Produce quality can be hit or miss. The meat seems fine but is suspiciously cheap–definitely not grass-fed or free-range or anything, but it depends on your budget and priorities. The small, orderly store is a big plus with two small children. I’ve always found staff to be friendly. Bring a quarter as deposit for your cart and your own bags. It’s a German company and it does remind me of stores over there–efficient. Thanks Katie….I do have an Aldi’s and Trader Joe’s so I guess that’s where I’ll start. Thank you for the info; it is helpful!! Sure thing! It’s hard figuring out what the good stores are in your area and balancing them with price, selection, distance, how many trips you want to make with toddlers…It can be frustrating. I miss TJs; lucky you! I have an Aldi and Cosco both close and just this week started my cost comparison list as I am a new Cosco shopper. Our grocery budget is under $500 for a family of 6. In 2014 I started moving toward whole foods. There has been give and take in all areas – what we eat (natural, organic or regular), what I am willing to spend time making, what I am willing to spend the extra money to purchase, but Aldi has been a viable and frugal option for me. bonus: i can get in and out in 30-45 min for my weekly shopping. 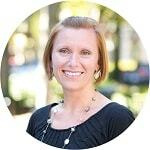 I am excited to have stumbled onto this blog and hope to continue to use it as a resource. Thanks! Tiffany do you have an article on what are the absolutely must-buy organics….I am familiar with the Dirty Dozen fruits/veggies that are the best to buy organic…but not having a Costco nearby…I’d like to know what I should buy organic and what I can pass on. Thanks! Thanks so much for this comprehensive list as I am considering a membership. I have a question about the EVOO: in here you say it is 11.99 for 1L but in the article about fridge testing it it was 11.49 for 2L Did they really increase the price that much or is it still a 2L bottle. In my area a 1L bottle is 6.49-6.99 and a bit cheaper if you can find the 3L tin. Hi G! 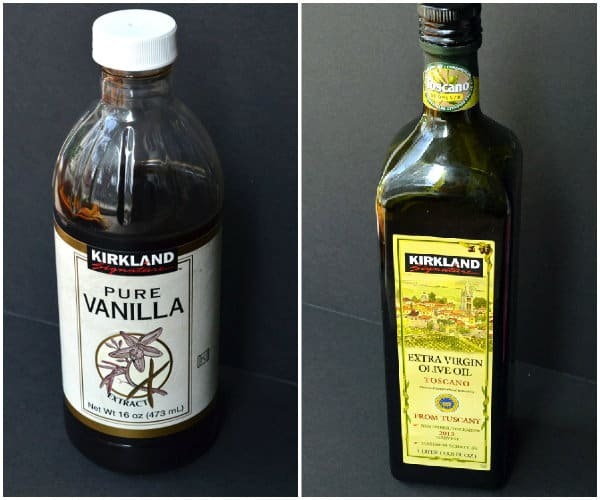 If memory serves me correctly, we’re talking about two different oils… There’s a toscano version that’s sold in 1L, but a Kirkland brand (not toscano) that’s sold in 2L. thanks for this list, I found it very helpful. I’d love to hear input from some fellow Canadians on their Costo whole foods purchases 🙂 I’ve been not the fence whether to get a membership or not. I have toured our local Costco and found some good prices on things, but they didn’t even have unbleached flour! A lot of your “Always Buy” list is similar to mine. Our Costco never has organic peanut butter though. It bums me out. Peanuts are one of the most sprayed crops and my kids eat a ton of it, so I’m pretty committed to sticking with organic pb. I buy everything from Costco when I can. Unfortunately, my closest Costco is 2.5 hours away from me. When I run out of something and have to purchase it elsewhere, it usually ends up costing me much more. I purchase my coconut oil from Tropical Traditions and Costco. I haven’t run the numbers to see which is cheaper so I usually choose the more convenient option. I know that’s not the frugal way, but I’m just being honest here. Thanks so much for this excellent resource, Tiffany. I appreciate the work involved in this post. Have you checked to see if Costco will deliver to you Heather? We’ve bought some big items online (think bed) and they deliver, but I’ve seen food too… the price is slightly different, but depending on the cost of gas and shipping, it might work out for the better! I love this list. We always buy the fresh organic spinach, dried organic dates, organic raisins, and many of the items you listed above. Fun tip; if you have a vitamix you can buy the costco peanuts and use the vitamix peanut butter recipe to make fresh delicious peanut butter for an unbeatable price!! Nice! I don’t have a Vitamix, but I can do the same thing in my Blendtec! I buy the Kirkland Signature Organic Non-Fat Greek Yogurt for $5.89/48oz every month. Not sure if this is the same one on your list because it’s a few years later. Someone mentioned the issue about non-fat yogurt being less healthy than full fat yogurt. I just mix in a little (1-2Tbs) organic half and half. I still get the thick consistency that I like with a little fat too. That’s a great tip Lisa! Thanks for sharing! Appreciate the info, but I wanted to mention that Vanilla extract is prohibitively expensive now. I think it’s like $23 or more for a 16 ounce bottle!! This was a fairly recent price increase, as of the past few months. I don’t recall it ever being as low as 6.99 though. I was surprised to see that organic meat wasn’t listed as a good buy. We find in Northern Virginia that organic meat prices are best at Costco for bulk as we can’t afford to buy a 1/2 of a cow. Are you buying in bulk from a farmer? Hi Catherine! I agree that organic meat is a good buy at Costco. The funny thing is that it’s fairly recent too. There was ZERO organic meat at Costco when we first joined!